What need was there to make this movie? The same reason, I suspect, that motivates an alarmingly large fraction of mainstream animators: to cash in on established name value. These days most Hollywood animated features have become sequels, prequels or remakes of existing material, essentially because studio heads have doubled down into the same uninspired margins of their peers, who fear the rejection of a fresh idea enough to allow established brands to do all the work for them. A story like this is tailor-made for those narrow goals, because audiences will show up regardless. And why wouldn’t they, especially in this case? So well-known is the persona of the Seuss creation that he has endured past generational gaps to become one of the immortal figures of the holiday. But what moviegoers will discover in this latest rendition is a being who has been sanitized beyond recognition. This is a film that offers backstory not to inform, but to render its central being an uncertain participant rather than an instigator in his own schemes. And a story like this does not work if the agenda is undermined before the final dramatic pivot. Early signs point to this possibility. When we first meet the Grinch, he is walled up in a compound high in a steep cliffside, which overlooks the small likable town of Whoville below – a place, the narrator reminds us, where everyone is kind to one another and seemingly liberated from cynical worldviews. So far, that keeps with tradition. But then we join the Grinch and his dog, Max, in a scene where they must venture down into Whoville and shop for groceries, all while attempting to avoid the prying eyes of people who are caught up in the holiday spirit; to him, their very demeanors are like a virus he refuses to catch. A more familiar version of the character might scoff further or even instigate problems. But this one creates a running commentary of overplayed sarcasm that seems like leftover dialogue from “Groundhog Day” – it has no sting or sincerity. And then there is a moment where he attempts, unsuccessfully, to avoid a sickeningly cheerful homeowner who believes he and the Grinch are good friends. This dubious exchange is played as if there might be a precious retort or sight gag, but neither occurs; it’s merely a scene to fill in time, or at least convince us that the divide of opinion between the happy people and the envious is a serious enough one to inspire the coming conflict. As obligatory Christmas preparations continue (the Whos promise this season to be “three times bigger” than the last), the movie occasionally pauses to peer into the inner-workings of Cindy-Lou Who, a young girl in Whoville whose inquisitive eyes and optimistic nature relegate her to the token position of pseudo-meaningful holiday desires. The situation: she wants to speak directly to Santa, whom she hopes will bestow a gift on her mother, an overworked woman raising three kids without any free time to herself. What is that gift she hopes to give her, you ask? Good question. The dialogue explaining the solution plays like bait: “please Santa, can’t you help her?” Help her do what? Win the lottery? Give her less responsibility at her job? Redistribute her children to different homes? This stokes the inner loathings of the Grinch, of course, who hears her pleas while passing through town and is flooded with memories of loneliness at the orphanage, without friends or loved ones or Christmas warmth. Poor, pathetic Grinch. Only much later do we realize, alas, that the perspective has softened him – that this rendition has made him not the pilot of impending misdeeds against the Whos, but a victim of his own youthful traumas. But heck, how admirable is it that he recognizes this in between all those conscious decisions to steal everyone’s presents and decorations? This insinuation is as pathetic as the arrogance that inspires it. The screenplay by Michael LeSieur and Tommy Swerdlow – both long-established writers of comedies – simplifies the scenario of Seuss’ narrative down to the roughest of outlines, then fills the material in with the sort of phony sentiment and forced convictions that you would expect of most live-action melodrama. That also means any of the Grinch’s solo adventures – in particular, his venture through Whoville on Christmas Eve night – are relegated to an unnecessary undertone that depletes the scenes of their enthusiasm. The great value of the original story was that we could, for a time, suspend our hindsight long enough to legitimately believe the Grinch will get away with his crimes. Here, every move is supplied an act of skepticism. He second-guesses every theft, every burglary. 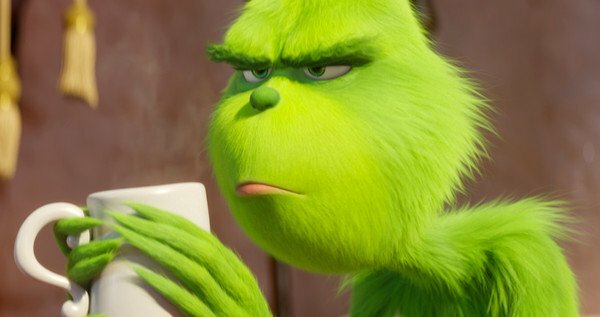 What that spells for the climax is fatal; there is no resonance in the Grinch’s great epiphany because he was led there by an internal voice casting doubt on his cruel plans. How exactly does any growth seem as profound, then, when it is forecasted by a shred of humanity haunting him well through the early material? But wait… aren’t I obligated to discuss, at least, the skill or conviction of the animators in what they create, well beyond the limitations of the story they are working with? That’s apparently the fairest thing to do, after all. Very well then: the look of the film is competent without being very special, because Dr. Seuss’ style was supplied to this premise well before the frames were rendered on a computer. The Grinch, his dog, his mountainous fortress, the town of Whoville are matches to that sensibility rather than reinterpretations. I suppose the bright colors and swiftness of the images will do well to keep the smaller kids occupied. But will they have the same response to this material that we did all those years ago, when the Grinch seemed thoroughly disagreeable until that one profound moment towards the end? Will they be moved by the power of Seuss’ arc now, even though the entire journey towards that moment is now occupied by meaningless exposition? To see what comes of this material is to be reminded of the great erosion of children’s stories, which once challenged young minds to fill in the gaps instead of doing all the work for them.